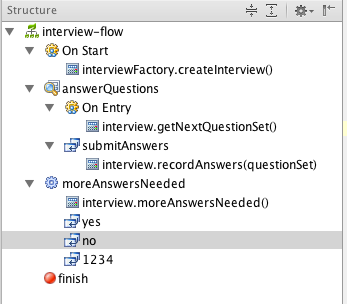 One of the features added in the last IntelliJ IDEA 12 EAP is Spring Web Flow support. This post is a quick overview of the enhancements. The Structure View now shows the structure of your flow.xml file. Need to visualize your flow definition? Want to quickly add a few states and transitions without editing XML? Please welcome the completely rewritten Designer. Spring EL is now fully supported in your flow.xml. Smart completion, navigation and refactoring are included. All built-in and custom attributes are now available in your JSP pages as well. Use Navigate | Symbol to quickly navigate to any state from anywhere in your IDE. In the editor, gutter icons make it easy to navigate to any parent or inheriting element, while Navigate | Related File allows easy access to parent and inheriting flows as well as subflows. Seamless access to all views provided by Spring MVC. We have just touched a few important areas here. Stay tuned for more improvements soon. Miss a feature or found a bug? Please feel free to leave your feedback in our issue tracker. This entry was posted in Demos, New Features and tagged Leda, Spring. Bookmark the permalink. I second the motion on Grails Webflow support. Would be a very powerful/helpful feature and much appreciated!